STIHL has always been at the forefront of innovation for arborists – we pride ourselves on producing machines that enable you to get the job done safely and efficiently. 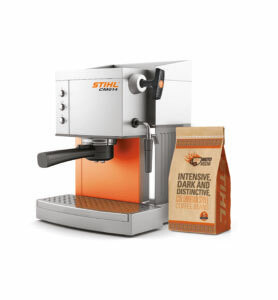 And our latest product launch goes one step further, delivering the ultimate fuel for your day, with our new petrol-powered, portable coffee machine, the CM 014 C-E.
No matter where you are, the benefits of the CM 014 C-E are clear – with no need for an electrical source, you and your team can enjoy freshly-brewed coffee at any time, in under two minutes. The CM 014 C-E uses our new Boilomatic technology, which ensures that the water is heated to the perfect temperature to deliver a superior brew. 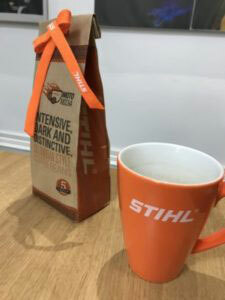 STIHL worked with coffee connoisseurs across the globe to produce a machine that heats the water to between 91 and 95 oC, the ideal temperature to dissolve the coffee. Water hotter than this can extract compounds from the coffee that produce a bitter and unpleasant taste, but the in-built Boilomatic gauge automatically prevents the water from reaching temperatures of more than 95 oC. Early mornings are part of the job for many tree workers, but you don’t have to miss out on your caffeine fix with the CM 014 C-E, which is ready to use wherever you are, whatever time you start. Combined with our new MotoMocha coffee beans, you really will have a powerful start to the day. P.S. This was our 2018 April Fools’ post – we don’t have a petrol-powered coffee machine. Yet!! What A fantastic Idea. I would love one. Dont suppose you need a coffee connesiur to test your machine. Will it boil faster if using 98 octane fuel? If Only!! I have to plug mine into my truck. An AP 100 powered Nespresso would be the way to go. Best April fool this year !Definitely will need an Award!